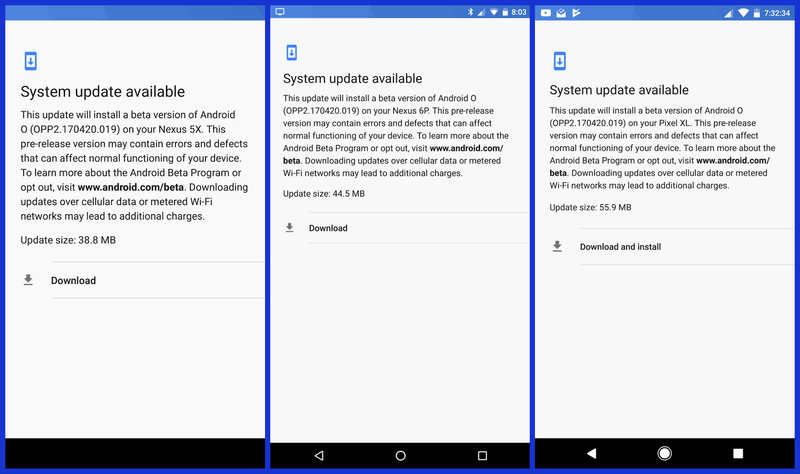 Yesterday, at Google I/O, Google launched the Android O's second developer preview and today they have already released an update for it. This is an small update which reportedly fixes Android Pay, which was not working with the yesterday's one. The build number of the OTA is OPP2.170420.019 and is weighing in at anywhere between 38.8 and 55.9MB, depending on which Google device you have. One tipster informed us that Pay is no longer throwing him an 'unsupported in this build' message and shows him a normal screen with his cards, but hasn't tested whether they're working or not. Installing this update on Pixel and Pixel XL goes like butter, but a majority of owners with Nexus devices appear to be having some trouble. Basically Nexus 5X, 6P and Nexus Player, are throwing errors and showing the dead Android logo in recovery. After a hard reboot, the devices are booting up fine, but they remain on yesterday's OPP2.170420.017 build. But those who flashed the O factory image are updating without issue, while those who took the OTA from Nougat are struggling. This is due to devices that updated from Nougat via OTA retaining the 7.1.2 build fingerprint. Flashing the factory image and then taking the OTA should get the update to work. There are no Factory image and OTA available for this update yet. An official post in the Android Beta Program Google+ page states that the update will hit all devices currently enrolled in the preview within the next few hours, but given the installation failures that Nexus devices are seeing, it's likely to be halted. We'll update this post with more information when we get it.